Without a doubt, Susan Sarandon is in a class of her own. The actress, who has been acting since 1970, has an Academy Award, a Screen Actors Guild Award and a British Academy Film Award to her credit. As a testament to the prestige of her career, she has also been nominated for nine Golden Globe Awards and six Primetime Emmy Awards. Beyond acting, Sarandon is an activist who has gained attention for lending her voice to political and social movements. She received the Action Against Hunger Humanitarian Award for her philanthropic efforts in 2006. Prior to that, in 1999, she was appointed as a UNICEF Goodwill Ambassador. Susan Sarandon is best known for her roles in The Rocky Horror Picture Show (1975), Witches of Eastwick (1987), Thelma & Louise (1991), The Client (1994), Dead Man Walking (1995), The Lovely Bones (2009) and A Bad Mom’s Christmas (2017). Susan Abigail Sarandon (née Tomalin) was born on the 4th of October, 1946 in Queens, New York. She is the eldest of the nine children of her parents – Phillip and Lenora Tomalin. Her father Philip was a television producer and an advertising executive. Her four sisters are Missy, Amanda, Bonnie, and Meredith; and her four brothers are O’Brian, Tim, Terry and Phillip Jr. Sadly, Terry passed away on the 19th of May, 2016. Susan’s ancestry can be traced to Hackney in London and Bridgend in Wales from her father’s side, and to Tuscany and Sicily from her mother’s side. She was raised as a Roman Catholic and attended Roman Catholic schools growing up. Though born in Queens, Susan Sarandon grew up in Edison, New Jersey where she attended Edison High School. She went on to study at the Catholic University of America, graduating in 1968 with a degree in Drama. During her time in the university, she worked with the legendary drama coach, director, and playwright – Father Gilbert V. Hartke. Susan Sarandon has definitely lived an interesting life and she has a romantic history to show for it. While in college, she met Chris Sarandon, a fellow actor and the two hit it off right away. The pair got married on the 16th of September, 1967 but sadly got divorced in 1979. Despite their divorce, Susan kept using Chris’ last name as her stage name since she had already begun working with it. After her divorce, she was romantically linked to several high profile names in the industry including Sean Penn, David Bowie, and Louis Malle. She, however, notably started a relationship with Italian filmmaker Franco Amurri in the mid-1980s. 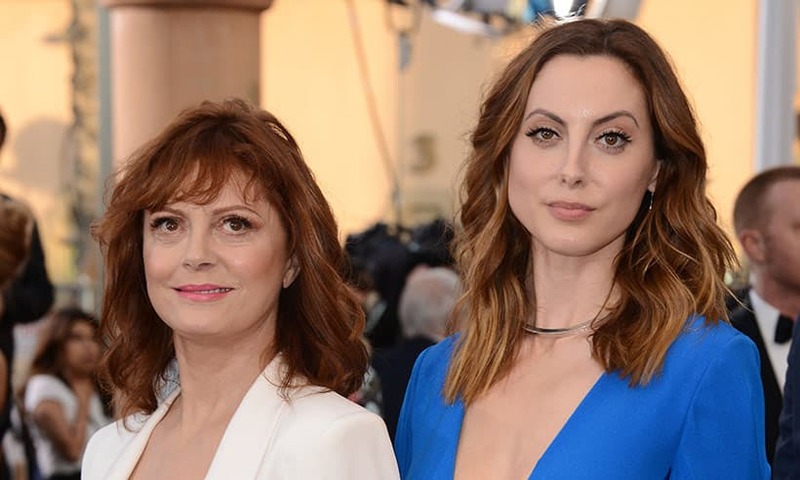 The couple had a daughter named Eva Amurri on the 15th of March, 1985. Eva, like her mother, is also a film and television actress with a consistent body of work to show for it. After her breakup up with Franco Amurri, Susan began dating Academy Award-winning actor Tim Robbins. Tim is also a screenwriter, producer, musician, and director. He is best known for his role of Andy Dufresne in The Shawshank Redemption, opposite Morgan Freeman. Together, the couple has two sons – John “Jack” Henry who was born on the 15th of May, 1989 and Miles Guthrie who was born on the 4th of May, 1992. Sadly, after 21 years together, Susan and Tim split up in 2009. Shortly after she broke up with Robbins, Susan Sarandon began dating Jonathan Bricklin, who is 31 years younger than her. Though the two were only together for five years, breaking up in 2015, the pair founded SPiN – a chain of ping-pong lounges – with Andrew Gordon and Franck Raharinosy. Susan Sarandon has an amazing total net worth of $50 million dollars. This is the result of a long and lustrous career in Hollywood. The actress has built an impressively eclectic career appearing in comedies, drama and some of the most iconic movies of her era. Susan Sarandon’s height is currently listed at 5 feet 7 inches while her weight is said to be 63kg (139 lbs). Her other body measurements are 38-27-36 inches. Her dress size is recorded to be a US size 10 while her bra size is 34D. Her shoe size is 7.5 (US) or 38 (EU). The actress maintains her impressive figure by watching what she eats and exercising frequently. She makes sure to eat only in moderation when it comes to her diet and also favors cardio and boxing for her fitness.